The recent iPhone 3.0 software release announced this week has got me thinking. There has been so much talk recently about big shifts in consumer web browsing habits and developments in multi-touch based UI design attributed to the iPhone that I suspect we have been missing out on something equally important. So important, it may threaten the very existence of some companies. To stay competitive, capture more customers and keep them, manufacturers must take note and provide live software platform updates, otherwise they may just end up like their phones – dead. Let me explain why I’ve come to this conclusion. 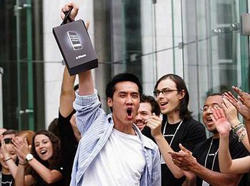 The new iPhone 3.0 software is said to provide 100 new features and 1,000 new APIs for developers. Sure, some of those features have been available for years on competitive smartphones from companies like Microsoft – cut, copy and paste or sending media files via MMS come to mind. But, catchup features aside there is a more fundamental shift here – the mobile phone has become virtual. By that I mean it’s a software based solution that sits on top of an increasingly common hardware platform that provides a big bright touch screen, GPS, quad band world communications, accelerometer / tilt sensor, camera, bluetooth, headphone socket, USB power and connectivity and so on. Differentiation is increasingly based on the style of the handset and user interface along with the software functionality provided on top of this standard set of hardware features. I’ve been a big fan of mobile devices for many years. My most recent upgrade was to an HTC Touch HD and while I am quite fussy, it is a phone I like very much. At Mobile World Congress I enthusiastically watched the Microsoft Windows Mobile 6.5 demo, only to learn that I must upgrade my nice new handset in order to get the new 6.5 features ;-( The last time I encountered this forced obsolecense I moved from Sony Ericsson to HTC. This shows two very different philosophies – the old style model where handsets are built, fixed and shipped, effectively dead, non-upgradable devices. Then we have the new software based model where hardware is constantly kept fresh and alive with updates over the internet. So is this simply down to handset manufacturers wanting to force more hardware sales? Well, going by Nokia it appears not. The world’s leading handset maker also releases consumer installable software updates. My N95 has had many new features added since it was purchased a few years ago. So is it just Microsoft? Well, they are experts at internet updates on the XBox 360, so perhaps this is a left over while we wait for Windows Mobile 7. The benefits of a living, software based platform is that it allows the market to adapt and grow more quickly, it is quicker and simpler to release exciting new features via software updates than to release new hardware. Consumers are now familiar with this model, with games consoles and music systems that automatically update themselves via the internet. The internet has come to mobile in more than one way – it’s no longer just about browsing; it is about keeping features and functionality up-to-date and allowing consumers to get the most from this fast moving mobile market, without switching sides. This entry was posted in mobile web, trends and tagged HTC, internet, iPhone, manufacturers, Microsoft, mobile browsing, mobile handsets, Nokia, software updates. Bookmark the permalink.